When it comes to boats and danger, you may think of drowning, flooding/swamping, collision with a fixed object, passengers falling overboard or even a skier mishap. But there’s another danger… a silent one. Another danger that has recently received attention is carbon monoxide poisoning. As a result of an incident on Eagle Lake in Maple Grove Minnesota a few weeks ago that linked to this colorless, odorless and tasteless gas, we thought it was worth a mention. If you could see carbon monoxide accumulating, it might look like this! Carbon monoxide is a little-known danger to boaters that has taken the lives of many unsuspecting victims. 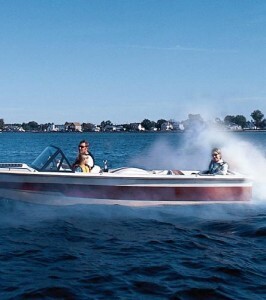 Many boaters have become victims of what’s known in boating as the “station wagon effect. It occurs when boats travel at low speeds with the rear loaded down and the bow in the air. Exhaust is sucked in from the rear and accumulates inside the cabin. You don’t even have to be on a boat to be overcome by carbon monoxide. When boats are bunched together in a small area, the very air can become deadly. Every year, boaters are injured or killed by carbon monoxide. Most incidents occur on older boats and within the cabin or other enclosed areas. Exhaust leaks, the leading cause of death by carbon monoxide, can allow carbon monoxide to migrate throughout the boat and into enclosed areas. New areas of concern are the rear deck near the swim platform with the generator or engines running and teak surfing or dragging behind a slow moving boat. Regular maintenance and proper boat operation can reduce the risk of injury from carbon monoxide. All carbon monoxide poisonings are preventable! To avoid the dangers of carbon monoxide, don’t operate your boat with passengers in close proximity to engine and generator exhausts, particularly on days with little or no wind. Early symptoms of carbon monoxide poisoning include nausea, headache, dizziness and irritated eyes. Don’t risk confusing carbon monoxide poisoning with motion sickness or intoxication from alcohol — get an affected individual away from any running engines or generators and into fresh air as quickly as possible. The United States Coast Guard has some excellent information on the dangers and seriousness of carbon monoxide. Boaters beware: Teak surfers, those who ride the back of boats while being dragged through the waves, may get carbon monoxide poisoning. The Early Show‘s Hattie Kauffman reports.